This Week: Pictures of my custom built rifle… Why we don’t aim for the leg or arm… Why I left the Agency… How to measure your gun belt size… And, taking a bulletproof panel on an airplane. However, if things “hit the fan” and I’ve got 15 looters trying to burst into my home, a handgun is definitely not what I want as my primary weapon. I want a rifle with a 30 round magazine to be able to defend my family against an angry mob if things should ever become that dire. Of course, I hope they never do. But because shooting an AR is a heck of a lot of fun… And because I believe it’s the best firearm for extreme situations (such as an economic collapse)… I recently worked with a custom rifle builder to create the “perfect” AR-15 with my exact specifications. However, when it comes to self-defense gear I’m never cheap because these tools are used to protect my family. I believe in buying once and buying right. Lower Receiver: Mil-Spec from CNC Machined of 7075-T6 forged Aluminum, marked “Cal Multi” with Mil 8625 Type 3 Class 2 Matte Black, with Hard Coat Anodized Finish. What this means: This lower receiver meets and exceeds all the various “Mil-Spec” standards for reliability, functionality and compatibility. The manufacturer is a former aerospace company that built parts forfighter jets. Upper Receiver: Mil-Spec from CNC Machined of 7075-T6 Aluminum with Laser Engraved T-Marks and M4 Feed Ramps with 8625 Type 3 Class 2 Matte Black, Hard Coat Anodized Finish. What this means: The entire upper receiver has been precision machined to fit perfectly with two of the most important parts of the AR-15 platform – the bolt carrier group and the barrel assembly (along with the lower receiver and other components). Barrel: 4150 Chrome Moly Vanadium Steel, 1 in 7 twist, 16″ Government Profile, HP and MPI tested, with QPQ Corrosion Resistant Finish inside and outside. What this means: The barrel is precision machined to Mil-Spec standards with a 1-in-7 twist rate for accuracy in this 16” package. The 1:7 twist also means I can stabilize the absolute widest range of ammo. It’s also made of 4150 “machine-gun grade” steel so instead of the barrel starting to lose accuracy after 5,000 to 15,000 rounds (like lesser 4140 standard AR-15 barrels) the barrel will stay accurate all the way up to 30,000 to 50,000 rounds. Gas System: Low Profile Gas with Mil-Spec Heavy Phosphate Coating, Mid-Length, Direct Impingement System for the straightest, smoothest shooting, and maximum reliability. What this means: Essentially, the longer the gas system the more reliable the AR-15 platform. 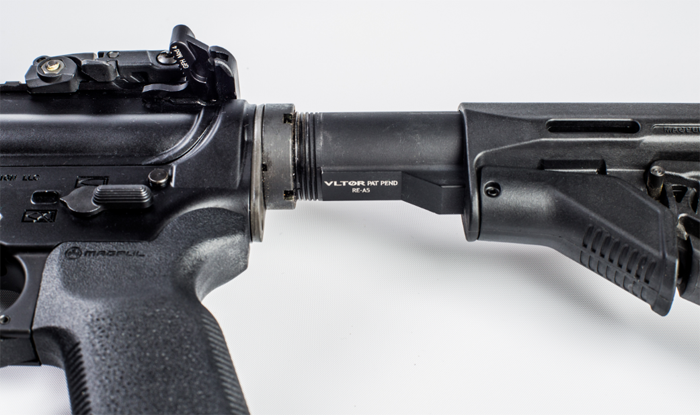 Direct Impingement (DI) was chosen over a Gas Piston system because of the greater part interchangeability, reliability, lighter weight, lower recoil and easy replacement parts in a “Grid Down” scenario. Muzzle Device: Yankee Hill Machine Phantom 5.56mm, 5-port muzzle brake and compensator, 5C2 model with aggressive points for hand-to-hand CQC (close-quarters-combat) fighting. What this means: First, the muzzle compensator helps reduce felt recoil so that I can make quicker follow-up shots due to less muzzle rise. Second, the 5-port design has no downward facing port which helps eliminate dust problems when shooting from the prone position caused by other compensators. And third, the aggressive sharp ends of the muzzle break can be used in close-quarters-combat. Bolt Carrier Group: M16 Profile, Mil-Spec HPT/MP Tested and marked, Chrome Lined gas key and firing pin channel, “full auto” BCG with Mil-Spec coating. What this means: I get better reliability because of the proper cycle time of the rifle due to the heavier “full auto” Bolt Carrier Group (BCG). Buffer: Specialized VLTOR SP-A5 H2 weight buffer system for mitigating felt recoil and muzzle rise ensuring optimal “gas pressure” for the widest range of bullet grain weights. What this means: The buffer and spring system works together with the entire gas system to give added reliability with virtually any ammunition. (The entire system virtually eliminates over-or-under gassing problems). Plus, this special VLTOR SP-A5 buffer system helps reduce felt recoil as well, giving a much flatter, straighter shooting rifle. 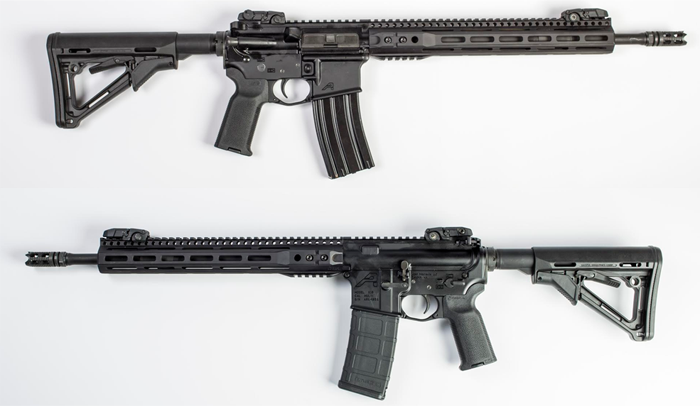 I realize this has been a lot of “techno babble” about rifles but if you get an AR-15 you definitely don’t want to skimp on it’s quality. If you’d like to find out more about my custom rifle including sights, charging handle, buttstock, and pistol grip, click here. When you click that link you’ll have a chance to get this same custom rifle and you’ll find out full details about all the parts used if you want to build your own. From John E: My issue with people is that hardly anyone is trained well enough to carry…. including cops. I am trained by a great man… my father. Why is law enforcement trained to shoot center mass every time? Why not take a leg or a shoulder? Why end the life? From Liz H: Jason, knowing you personally from the Toy Corner, I’m curious why you would quit the CIA? Just curious, thank you. A: The Toy Corner was a place I worked when I was 15 and was one of the first “real” jobs I ever had. (I have good memories of that place). The reason I quit the CIA was because of lifestyle. At the end of the day I realized family is most important and I didn’t want to be 85 and lonely because I put work before God and family. From Adam M: How do I properly size the gun belt? Do I give you my exact waist size of 34” or do I add 2 inches, which would be a 36” size? A: For the Escape & Evasion Gun Belt I created a 35-second video showing you how to measure yourself for the belt size you should order. It’s under the videos tab. Click here to watch it. From John R: Have you any difficulty flying with your bulletproof panel? From Dave R: I’m contacting you is to ask if your company shared your customer database as part of any deal made on Shark Tank? I’ve attached a screen capture of a SMALL list of emails I’ve started getting from a variety of Shark Tank sources. A: I have never shared any of my databases and never will. I take your privacy very seriously. I’m guessing you clicked on something Shark Tank related somewhere else on the web and they “cookied” you or something along those lines. P.S. Click here if you want more details on the custom built rifle I discussed in today’s article. Hi Jason – When I click on the e-mail link to get the rest of the article, the right margin is set improperly and I lose the end of each sentence. Needs to be re-formatted? I noticed this on a previous e-mail but didn’t comment on it as I thought it might have been fixed by now. Enjoy your comments and products. Although there are places where an assault rifle is appropriate, I wouldn’t classify a home invasion as one of them. You run the risk of bullets going through walls and windows when you miss your target, endangering other people. A better weapon for in-home defense is a (legal) short-barrel semi-automatic 12 gauge.